Did concern about oil supplies figure in to the decision by the US, the UK, France and other countries to drive the Iraqis out of Kuwait? Probably to an extent. But it was far from the only reason. The Iraqi invasion was a clear-cut case of aggression, and the consequences of allowing Saddam to get away with it would have been disastrous for all kinds of reasons. The “No Blood for Oil!” slogan was heard again as the US and the UK prepared to invade Iraq and overthrow the Saddam regime in 2003. Whatever you think of that action and its botched aftermath, the idea that it was all (or even largely) about oil strikes me as even more dubious. In fact before the invasion, the Iraqi regime made clear that it would have been pleased to partner with Western oil companies in exchange for an end to sanctions– for which Big Oil actively lobbied. Trump couldn’t make it any clearer. 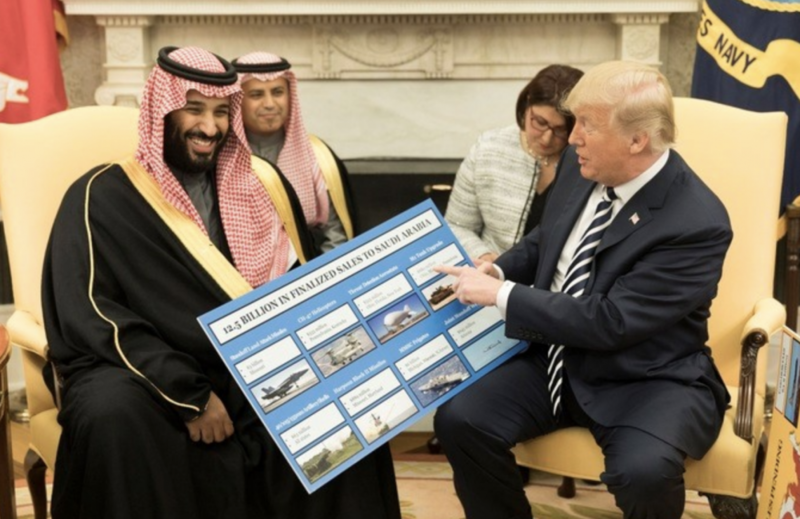 In exchange for the Saudis providing enough oil to keep prices somewhat lower at the pump, Trump rejected the findings of his own intelligence agency and pretends that Crown Prince Mohammed bin Salman may not have approved the gruesome murder of Jamal Khashoggi. And he continues to arm the Saudi regime for its indiscriminate attacks against Houthi rebels in Yemen, which have killed thousands of civilians and contributed to a looming famine which threatens millions more. It may not be American blood this time (although Khashoggi was an American resident). But it is blood for oil (and arm sales).